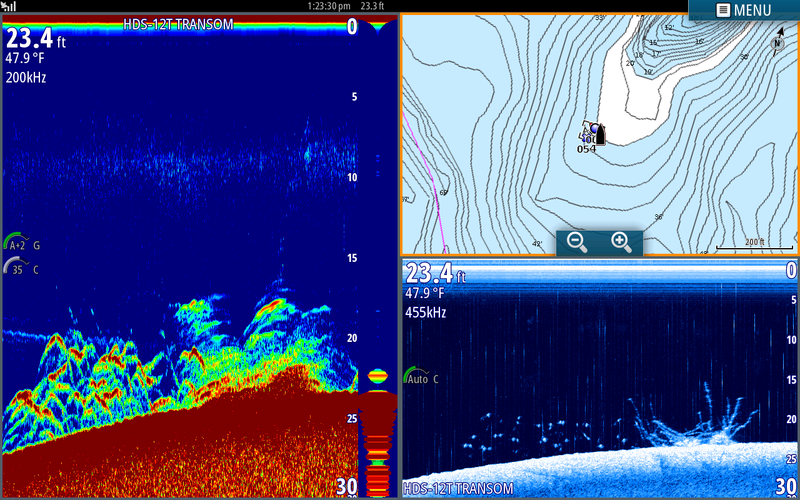 This is a Simrad screen shot of a school of 8 inch Gizzard Shad with a Striper just to the right of it. The water temp is COLD and the shad are grouped very tightly. You can see a couple Gizz on the outside edges of the ball of bait. This bait ball is very dense and is depicted by the intense yellow in the center of the ball. Anthony threw on this school and caught enough bait in one throw to go fishing for the day. When I see this on my Simrad I do not fish in the area, fish are not feeding and I will catch O. If that bait was broke up and scattered throughout the screen I would pull baits through it and catch Stripers. This is a Lowrance shot of a school of Largemouth Bass. They are relating to the drop off hugging the bottom stacked on top of each other. We dropped a bait down to the Bass and hooked up. It might have been a different story trying to catch them on a spoon or artificial bait, the fish here are not aggressive. If they were more aggressive they would have been higher on the ledge and up on top of the hump. We had our sensitivity up real high here that is why there is so much noise in the pic. 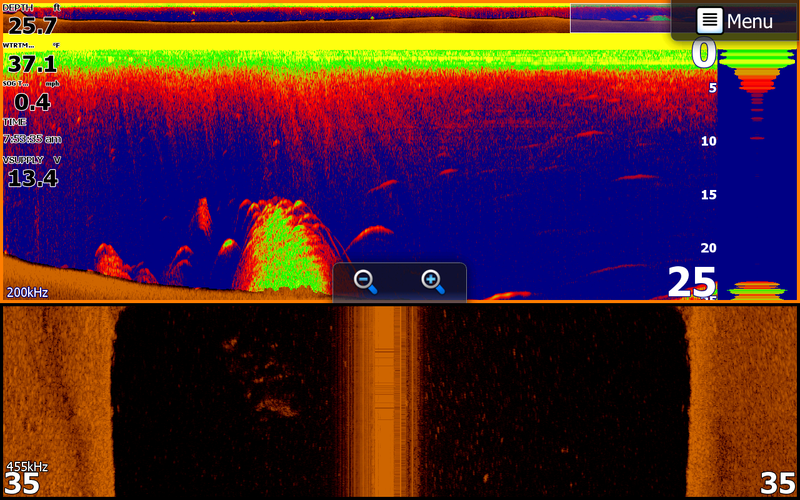 In this Lowrance shot we are pulling baits at 22 feet deep. Fish had been congregating between 20 to 28 feet deep all day that is why we had our baits set at that depth. You can see the Stripers "stacked like cordwood" right on the bottom. Again, these fish are not in an aggressive mood. We did pop 2 or 3 here but only because we had our baits in their eyes and using live bait. If they were feeding all 10 rods would have hooked up. You can also see fish on the side scan screen. These fish were punk Stripers. 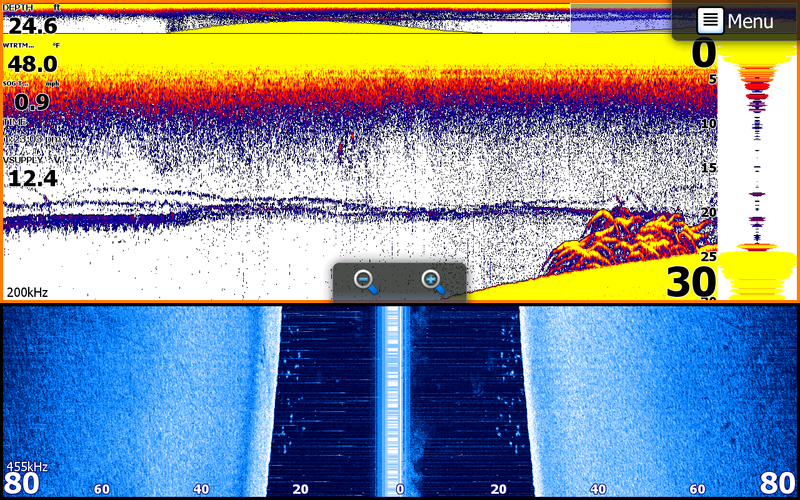 In this Simrad shot the Echo page is showing fish from 20 to 28 feet deep again as it did all day. There is something on the bottom at 22 feet. If you look at down scan on the bottom right side of the screen it is pretty obvious what you are looking at. You can see fish relating to a piece of structure on the bottom. It is obvious that it is a brush pile that they are relating to. We caught Stripers on the deeper side of the brush and Largemouth on the shallower side of the brush. I did not get a pic of the Bass because we were fighting fish at the time. You can also see our Navionics map in the upper right side of the screen. You can see all the breaklines and an obvious tip of a point that we are approaching. We are the black boat in the pic and I have a couple waypoints that I had marked the brush at in previous trips. The white on the map is our Depth Highlights. We highlighted 20 to 24 feet and Navionics automatically shows it on the entire lake that way. 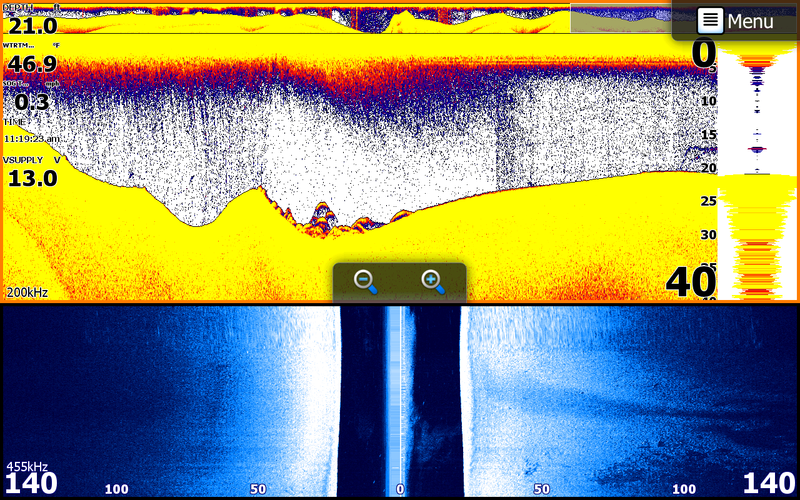 When we think fish are in certain depths like they were today we use this feature on the map. It makes it soooo simple to keep the boat in the productive areas enabling us to catch fish almost all day long. When the Navionics map is zoomed out it is clear to see the path you want to keep your boat in. We were pulling down lines and boards with split shot keeping the boat in the "white" area of the map concentrating our down lines in the productive depth but with the boards we were able to cover water 40 yards either side of the boat allowing us to work depths from 10 to 50 feet deep all day. Today's technology makes my fishing easier and more enjoyable. Simrad and Lowrance are the obvious "Bomb". They show me what is happening under and around my boat. They are my eyes. Without my eyes I can not fish. Imagine doing anything without eyes. If your eyes are not 20/20 you get glasses to see. If your equipment is not seeing 20/20 you need another prescription. Simrad and or Lowrance is the answer. Navionics is my map. It guides me to the areas that I suspect fish to be holding. With one foot depth increments it tells me in advance where fish should be and guides me to them. You see, I paid for a guide [Navionics] and reap the benefits from it every day. My electronics work for me, they should work for you as well. If you need new Glasses or a Guide, go to Greentop Sporting Goods. Thomas Harris is the best in the industry when it comes to Navionics and Steve Lane is the Guru of Electronics. I am not trying to get you to spend money. Heck, you already have buying a boat, a vehicle to tow it with, a place to keep it, rod, reels, tackle, etc. Your time has to be valuable to you. Complete the package. Go to the water with the tools you need to make the most of your adventure. If you want to catch fish and are not happy with your results, this could be the final key to your success!